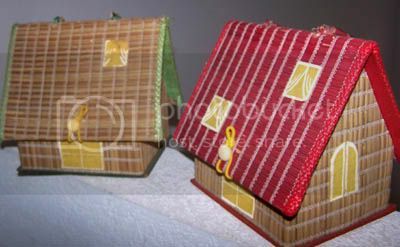 Pair of Raffia House Purses. Early 1970s. Maker: Gary Gail Dallas, according to the sticker on the bottom of each purse. (Note: This designer was sometimes known as Gary Gails, plural. I don’t know why he used different names on his bags.) 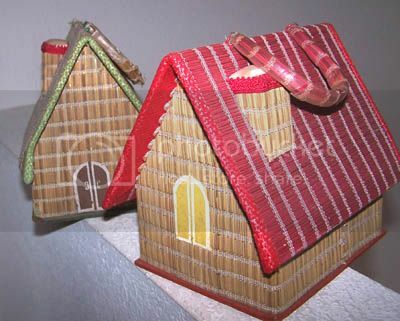 One house is green and natural wicker or raffia (there was some argument in my own house about which material it was; thank you, adult daughters who can’t ever let me be right), and the other in red and wicker/raffia (or whatever). They both have fabric windows, doors and chimneys, and are lined in satin with contrasting rickrack. Each also has an oval mirror glued to the inside of the flap. They close with elastic latches over plastic buttons.